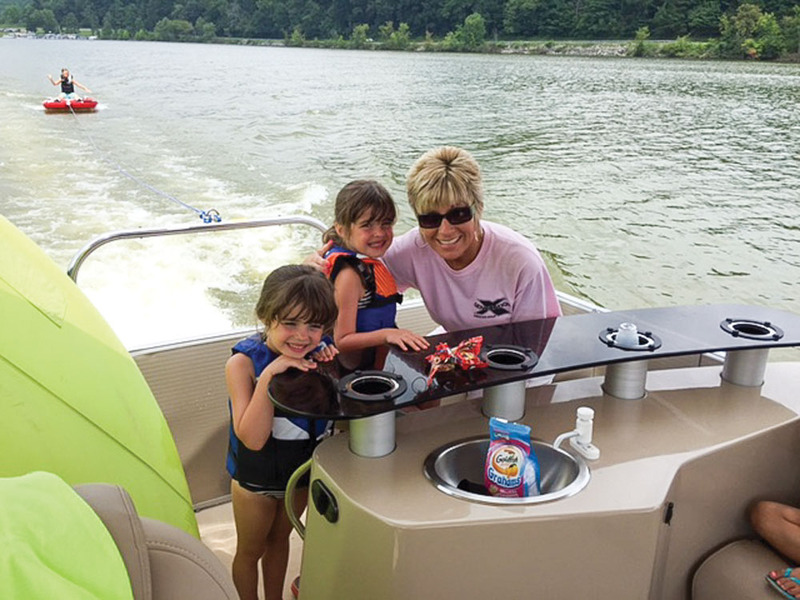 It’s no surprise that pontoons are leading the pack in providing entertainment opportunities for owners who want to invite multiple couples out on the water for a day and night of fun. While many pontoons do a good job of creating a conducive environment for merry-making, the Sanpan 2500 Wet Bar expands this ability with an entertainment center you have to see to believe. One’s ability to present a smorgasbord of snacks for all to see and enjoy is where it’s at, and the 2500 Wet Bar provides six Solid Surface countertops that serve as a blank canvas for culinary and beverage creations. Surprisingly, there are only two barstools, surrounded by a vast perimeter of countertop space that pretty much takes over the back third of this near 27-footer. But at a real party, few people want to sit anyway, and Sanpan designers have this covered with bar heights that are geared for the standing-room-only crowd. The twin bar stools are more than cushiony lily pads; they have stainless steel backrests and they swivel. There’s even a standard gas grill for kebab-making pleasure. A cool feature is the LED-lit cupholders that feature a stemware holder for wine glasses. Cockpit tables are sometimes as wobbly as a newborn colt, but the standard one in front of the amidships L-lounge is a boulder-solid, two-pedestal slim-line table that’s finished in a classy matte burlwood. 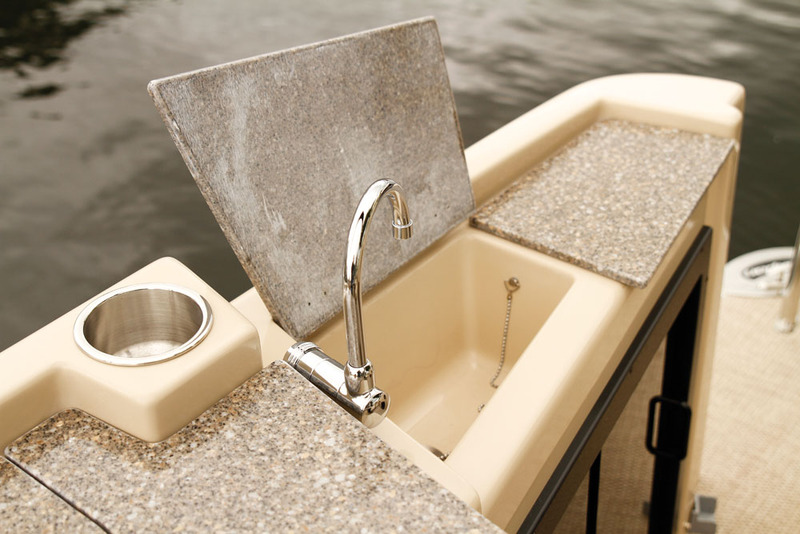 For 2016, the Sanpan 2500 Wet Bar features a new exterior look with an intricate exterior rail design that comes in standard anodized aluminum or optional powder-coated black ($1,133), which our test boat was sporting, even though they kind of got lost in the all-black fencing. Playing around with design features on the Build Your Own Boat feature on sanpanboats.com, I preferred the black rails over the Taupe or Vino fencing, to give them more contrast. Another new feature, forward of the bar, is the furniture. Gone is the pillow-top, overstuffed look; instead, the lounge seats feature Super Soft vinyl that lives up to its name and diamond stitched accents for the lumbar support. When Yamaha introduced the V MAX SHO 250, it believed the engine would be used almost exclusively on high-performance bass boats and flats boats, so it was only available in a 20-inch shaft configuration. 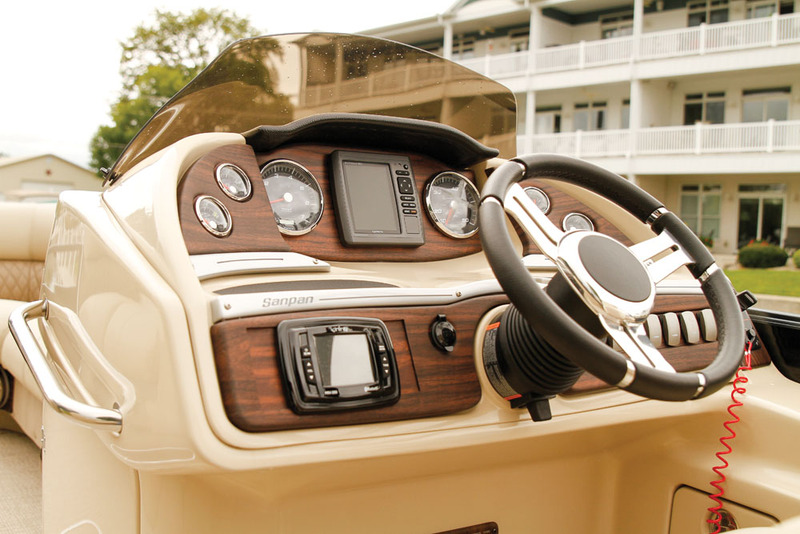 In 2015, Yamaha added a 25-inch shaft version that brought a host of new boats into its wheelhouse. 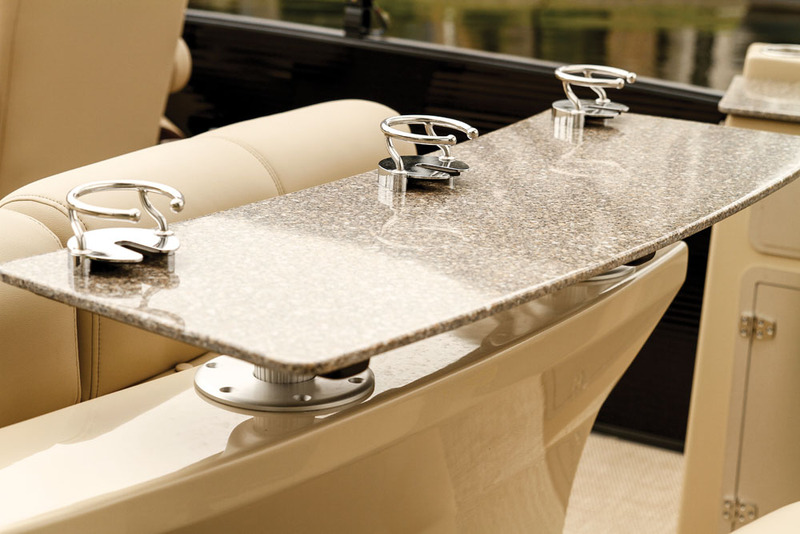 For 2016, they are appearing en masse on boats such as the 2500 Wet Bar, because even pontoon owners want the option of thrilling performance. 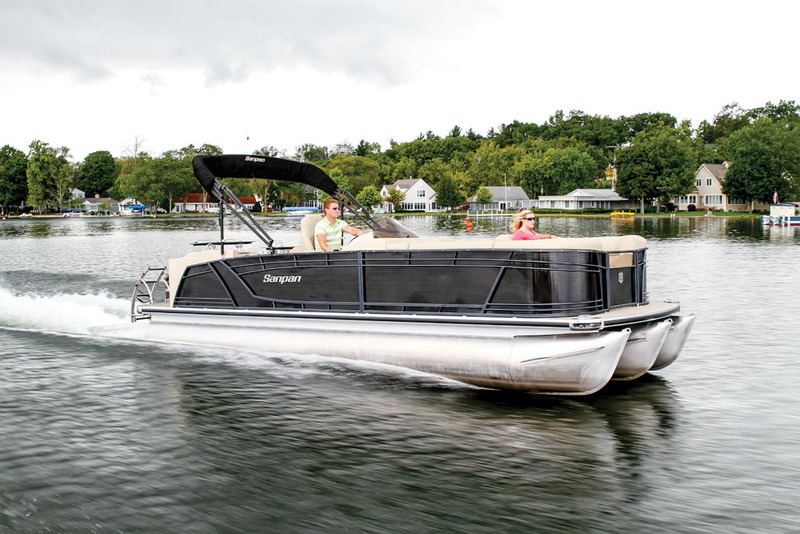 Our test boat had the Triple Tube package ($6,177), which includes 27-inch tubes (25-inchers are standard), an aluminum underskin, lifting strakes, inside skirting and hydraulic, power-assisted steering. The oversized tubes and the four lifting strakes took advantage of the outboard’s phenomenal power out of the hole to deliver a quick 2.6-second time to plane. Time to 30 mph for the beefy 2500 — a wet weight of 3,532 pounds and an LOA of 26 feet, 10 inches — was 8.7 seconds. Top speed was 41.5 mph. Sanpan offers a staggering 128 engine options, so every major outboard engine builder is in play. Engine sizes range from 50 hp (don’t do it!) to 300 hp of Mercury or Evinrude power. We’re not sure why Yamaha and Suzuki are excluded from the 300 club. 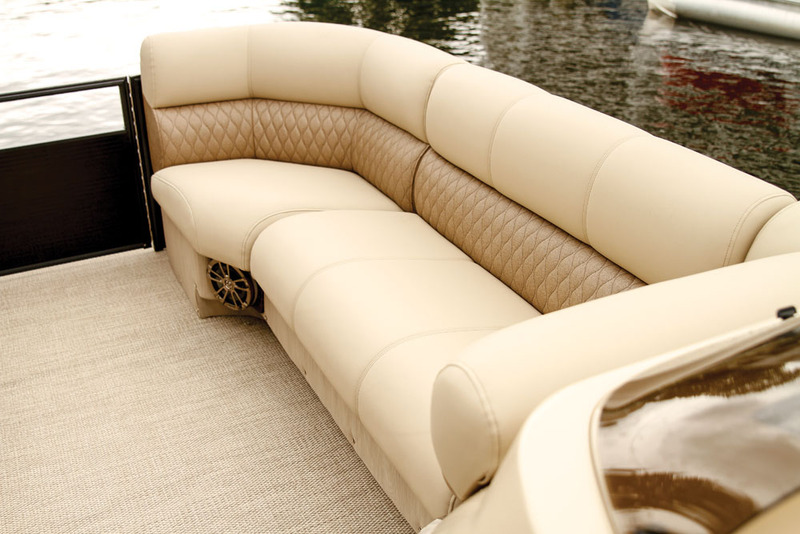 The Triple Tube option is ideal for boaters who ply large bodies of water or who carry up to the 15-person max load. The oversized 27-inch tubes’ extra flotation allows the 2500 WB to ride high in the water and gives it good seakeeping ability. Because the lion’s share of seating is in the front two-thirds of the pontoon, the ability to trim up under heavy passenger loads is crucial. The 2500 WB seemed to sit a little lower in the stern, which probably helped get the nosecones out of the water when trimmed up at higher speeds, for reduced drag and better performance. Its smooth ride was definitely luxury car-like, but when I cranked it into a hard turn, its inner sports car kicked in, and with just a little lean it banked smartly. Entertainment is the 250 Wet Bar’s primary mission, but it can handle other duties. Sanpan is Godfrey’s most luxurious brand, and its extensive options list includes just about every available feature the company offers, so buyers can tailor it to whatever activities they like. If waterskiing is in the picture, a few options are all it needs. There is a ski tow cage ($802), but the best option for towing is probably the giant-size TurboSwing ($1,258), which encircles the outboard and keeps the towline from rubbing on it. Because the outboard isn’t mounted on a bracket or on a center tube that’s scooted back a little, it bisects the swim platform, which limits moving-about room. But it has an awesome four-step, polished stainless steel boarding ladder that’s curved for aesthetics and so people who are reboarding climb at an angle rather than fighting gravity. For storage, get the centerline ski locker ($802), though we wish its lid had better nonskid properties, to grip wet feet. Entertaining is going to be the standard activity, so go all the way. The standard stereo is a pretty bangin’ eight-speaker Bluetooth Infinity 350PRV system, but the speakers can be upgraded to Polk Audio with a Wet Sounds subwoofer and amplifier for $1,427. Throw in a 12v blender for $199. There’s no standard table up front, so the cooler/table option ($383) would be a good choice. And because the bar eats up seating capacity, get the bow filler sectional ($603) to turn the bow into one giant U-lounge. The elegant helm for the designated driver is turnkey ready. The raised platform increases visibility and is padded with Versa-Teak for better traction, and the captain’s chair has self-leveling armrests for comfort. Flush-mounted into the dash is a standard Garmin 53DV depth/fishfinder that can be upgraded to a Garmin 547 GPSMAP ($375) for navigation and fish finding. Sanpan offers an extensive choice of flooring materials, if the standard Country Beige Cube carpeting just has to go. The options are laid out in sectors, so one’s flooring choice for the bar area doesn’t have to extend to the floor amidships or in the bow. 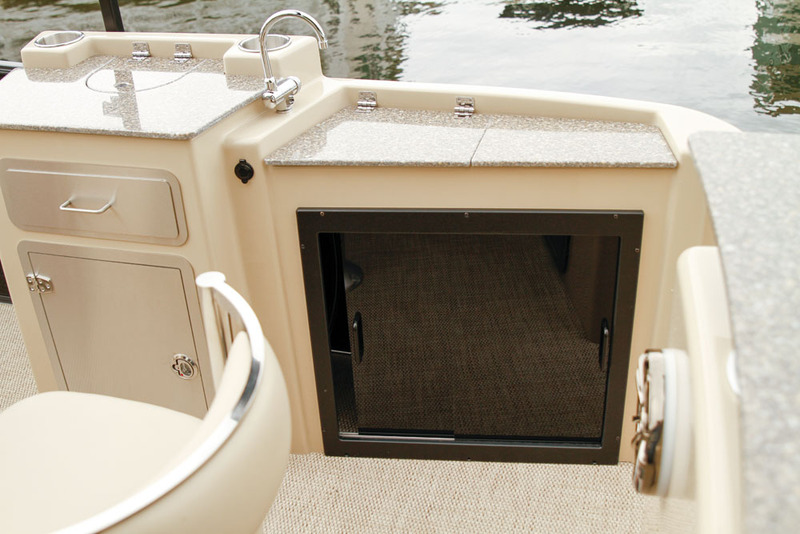 Metro Grey Seagrass flooring was on our test boat and is one of the most popular choices; it comes with an upcharge of $2,118. I wish it had more than a 25 hp Yamaha, but because Atwood Lake has a 25 hp maximum, I can’t. I’ve been into boating since I was 7 years old and have had all kinds of boats over the years, but my favorite boats have been the last three Sanpan pontoons I’ve owned. To me, they are like the Lexus of pontoons. I have a cabin on Atwood Lake, which is beautiful but is restricted to boats of 25 horsepower or less, which makes pontoons a great fit. My son, Lukas, and I love to fish for saugeye, which is a cross between a walleye and a sauger. Our last Sanpan had pedestal fishing seats, but fishing off our new 250 is easy. Obviously, the Wet Bar is the main reason I got this model, and because of the restriction on our lake, entertaining is one of my major activities. When we go out, we spend all day on the water and love to pull up on a beach and just relax. We have events on our lake, such as the Alive Festival, which has a stage facing the water, so we can pull up in our boat and hear great music while lounging in our living room on the water. I’ve bought all three Sanpans at Atwood Lake Boats, and I go back because of the amazing customer service they give me. LOA: 26 ft., 10 in.